This week I have a fic for you from DC's Flash series. It's cute, it's fluffy, but it's also quite hard-hitting. This is a fic about Iris and Barry when they were teens, so before all the metahumans and super-powers started to infiltrate their lives. The action in this fic centres around Iris calling her father (and Barry's foster father,) Joe West to come pic her up from a sleepover, even though it's after midnight and she'd been excited to go. I think this fic handles racial issues well - but if I'm wrong, please let me know! 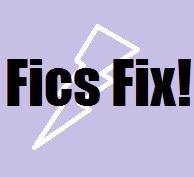 Warning: the major theme of this fic is racism.